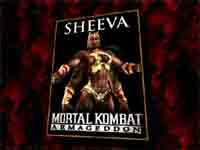 A female of the four-armed Shokan race, Sheeva once served as protector of Queen Sindel. As brutal as Goro and Kintaro, she possesses more than enough power to destroy any opponent unfortunate enough to cross her path. Midway has updated The Official Mortal Kombat: Armageddon Website. A gameplay video for each fighter has been added. Click here to visit The Official Mortal Kombat: Armageddon Website. Cinder of Midway Boards confirmed that the XBox version of Mortal Kombat: Armageddon has been delayed by about a week. However this does not affect the release of the PlayStation2 version, which is scheduled to ship on October 9th. Click here to visit the original topic. The Official Mortal Kombat: Armageddon Website has been again updated. A high resolution version of the opening movie has beed added. Click here to visit the hidden page. Thanks to KHILADI for the news.